Æbleflæsk” - Apple Pork is one of the oldest Danish dishes from the middle of the 18th century - and was originated from the rural country kitchens located in different regions in Denmark. There are different types of recipes that are prepared locally - and in its own style and variation. But the two basic elements in the dish are apples and thick slices of streaky pork - which at that time either was preserved by smoking - salting - or even air-dried - to preserve the pork for long life storage that could last for over one year. The dish were prepared and serve every week during the apple and cold winter season from September to March - and did provide lots of energy for people working and living in and around the countryside of Denmark. When the industrialisation period started in the 19th century -and many peasants moved to the bigger cities for work - the “Æbleflæsk” dish followed with the new inhabitants - and slowly the Apple Pork became very popular among the native citizens too. Today the tasty and mouth watering “Æbleflæsk” is turned into a national winter supplement and recipe - that is enjoyed by nealy every Dane at wintertime - and especially at Christmas. The preserved meat is exchanged with thick slices of fresh and juicy streaky pork. The combination of apples and streaky pork - gives a perfect match and flavour - that is second to none. The dish is found on the menu in many restaurants in the city - and we have set up a recipe for home cooking as well. Delicious Danish Apple Pork - "Æbleflæsk"
The "æbleflæsk" dish is over 250 years old - and has been a traditional everyday meal for generations of Danes that just want to taste some warm and healthy food in the wintertime. 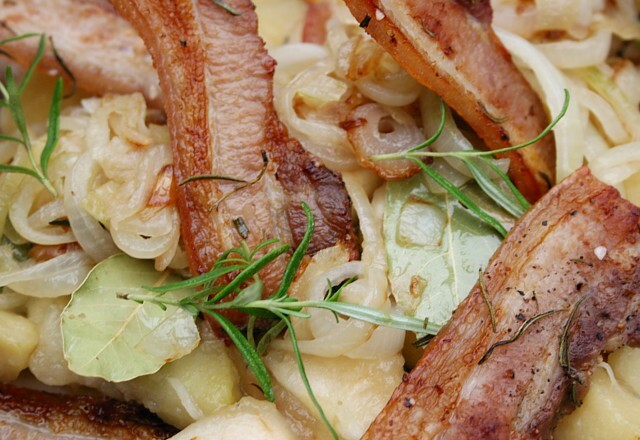 "Æbleflæsk" - or apple pork is one of the most popular and favourite dishes in Denmark. Choose always fresh thick slices of slight salty streaky pork for your "Æbleflæsk" dish - together with good and medium sweet apples - then you can be sure to succeed with your Danish Apple Pork. Fresh onions and tart apples ads the special flavour to this delicious Apple Pork dish and gives the best taste together with the thick pork slices - as well as sending a rustic aroma all over the kitchen. 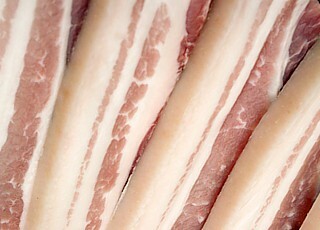 - Select 10 thick slices of fresh streaky pork - and place the pork slices on the oven rack. Put a little bowl of water underneath the rack to keep the streaky pork slices juicy during roasting. - Then preheat the oven to 200°C. Place the rack with the slices of pork in the heated oven. Roast the pork in the oven for about 15-20 minutes - until the slices are crispy and golden. Remove the rack - and let the slices drip off on a paper towel. - Melt the butter in a large saucepan. Cut the onions in rings and fry them till they are golden. 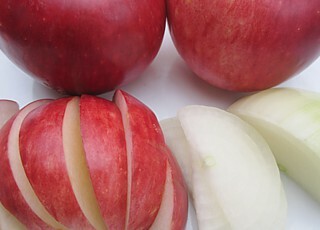 Remove the onions to drip - and then ad the apples into the saucepan - with some of the remaining butter from the onions. Let the apples simmer for 3-4 minutes with some bay leaves plus rosemary leaves - to your taste - then ad some sugar and water until the apples have turned into a suitable rustic pulpy mash - where the structure of the apples still are visible. Then ad rest of the sugar. - Serve the apple pork on fresh rough rye bread - that is spread with Danish pork lard. Start with a layer of the apple pulp - then the fried onions - and then decorate with the golden and crispy streaky pork on top of the mashed apples. Garnish with fresh rosemary leaves. You can also buy various ready-made "Æbleflæsk" - Apple Pork in supermarkets and grocery stores - but it is not as tasty as the home cooking version. Velbekomme - Enjoy yor meal! To be updated and subject to change!